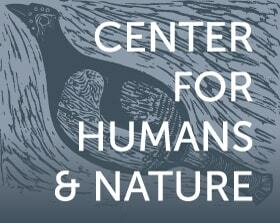 Thank you so much for your interest in the Center for Humans and Nature. We have no job openings at this time, but we encourage you to connect with us on Twitter, Facebook, and our weekly email dispatch to hear the latest! "A highly intelligent, unusual, demanding book that asks for, and rewards, serious attention. It reflects the quality of a fine mind, a passionate spirit, and a dedicated champion of 'nature alive.' It is a worthy book for a world that needs it."